On Friday 3 April 2015 Royal Caribbean International officially took delivery of its 23rd ship, Anthem of the Seas, at a signing ceremony held in Bremerhaven, Germany. 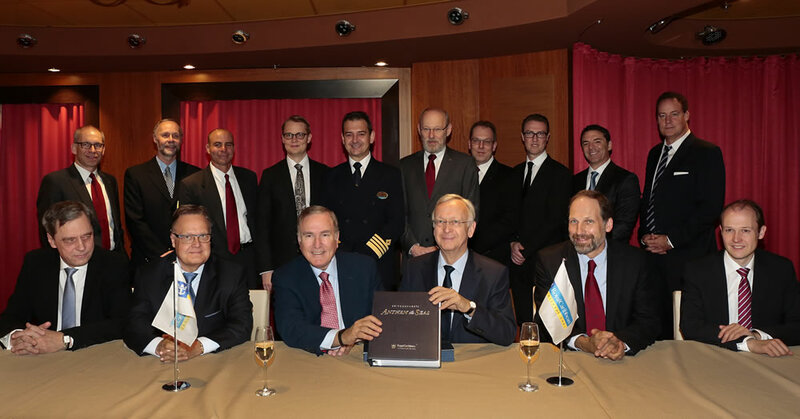 Royal Caribbean Cruises Ltd Chairman and CEO Richard Fain received the second of the company’s Quantum-class ships from Meyer Werft Yard’s Managing Partner Bernard Meyer. Anthem of the Seas will next sail to Southampton, arriving on Wednesday 15 April, where she will be home-ported for her inaugural season of sailings to the Mediterranean and Canary Islands. The ship will be inaugurated on 20 April, when travel agent Godmother Emma Wilby will name the ship before performing a song for more than 1,300 invited guests and dignitaries. In November, New York Harbour will become the ship’s permanent home, sailing regularly from Cape Liberty Cruise Port to Bermuda, the Caribbean and Canada and New England. Independence of the Seas, which Anthem of the Seas replaces in the UK for the summer 2015 season, will return to home-port once again in Southampton for the summer 2016 season. Royal Caribbean has also released an infographic, which can be seen below, depicting the fitting out process prior to the Anthem of the Seas handover. It documents that the ship has been pre-loaded with 61 tonnes of fresh fruit and vegetables, 10 tonnes of fish, 79,000 eggs, 22,200 litres of still water and 12,000 litres of sparkling water.